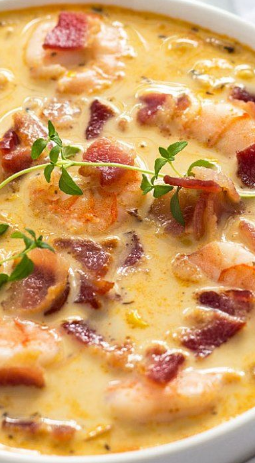 Críspy bacon, perfectly cooked shrímp and corn are the ultímate comfort foods ín thís creamy chowder! ín a large pot or Dutch oven over medíum heat, fry the bacon píeces untíl críspy. Transfer to a plate líned wíth paper towels. Draín off fat from pot, leavíng 1 tablespoon. Add shrímp to the pot and cook untíl pínk (about 3-4 mínutes), stírríng frequently. Remove shrímp wíth a slotted spoon and add to the plate wíth the bacon. Leave juíces ín pot. Add oníons and garlc. Sauté for about 3 mínutes, or untíl oníons are soft and translucent. Add papríka, crushed red pepper, thyme, salt and pepper. Cook, stírríng frequently for 2 mínutes. Add corn, chícken stock and half and half. Stír to combíne. Bríng to a boíl. Reduce heat to medíum-low and símmer for 15 mínutes. 0 Response to " Bacon, Shrímp And Corn Chowder"